Watchman Monitoring is “white label” by default. 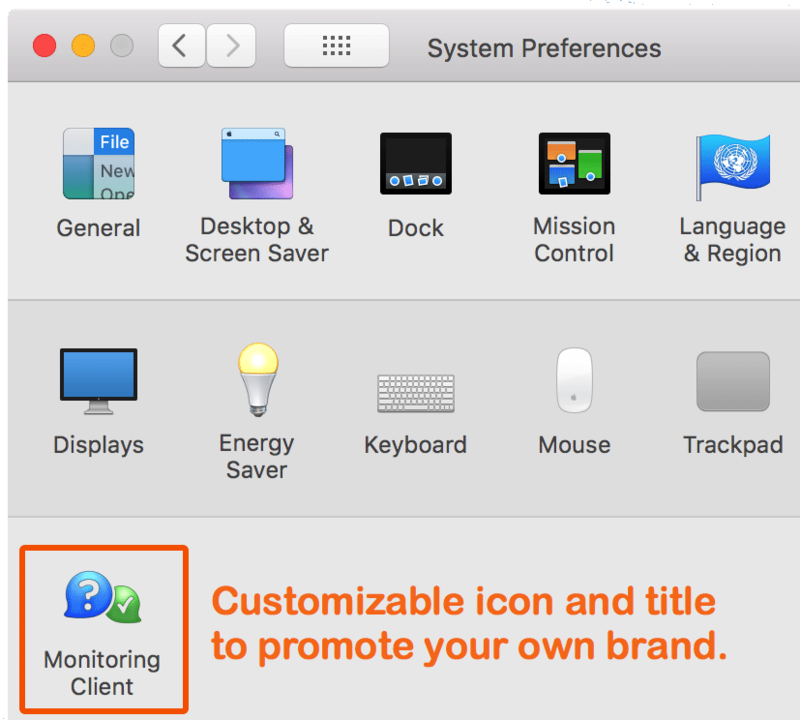 As a subscriber, you can rebrand our monitoring solution with a custom logo and title. How long does the Custom Branding process take? We aim to provide you a sample of your branded installer for your approval within 24 hours. Once approved, your custom branding will propagate to your end users’ computers as a part of our auto-updating process. What if I want to make a change later? Custom Branding is a one-time purchase. Submit change requests as needed, and a proof will be returned for your approval. How do I submit a change to my Custom Branding? Select “I’ve paid” in the form to the right, and fill in portion you wish to change. We will send a proof for your review. PNG? ICNS? What if I don’t have my image in the right format? We are happy to convert images as needed. Please ensure that the logo for the PreferencePane is square, and the images for the Installer.app and installation dmg are 620 x 418 pixels. We’ll handle the rest. What actions should I take after Custom Branding is approved and posted? Replace any installers you’ve downloaded prior to branding with a new, branded version. This includes any installers you may have hosted on your website or copied to USB flash drives. This would also be a good time to update any computers that have the auto-update feature turned off. What if I only want to change the language in the installer’s Introduction and Summary .rtf files to my local language? We will gladly make this change free of charge. Just submit the Introduction and Summary files in your local language as a free adjustment, and we will add them to your installer.